Condition: Very good condition. 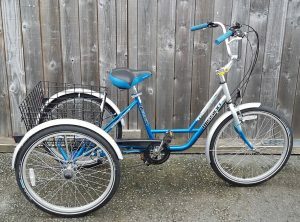 This is a pedal assist electric powered bicycle, suitable for ladies or gents. Comes with brand new battery and charger, new tyres with slime tubes, new grips, lights and cables plus a brand new display/control unit on handlebars. Bike has had a full service. See our other 2nd hand bikes for sale on this website and in our showroom (not all stock may be on website so viewing is recommended)! Giant Twist Freedom CS Lite Electric Bike for sale has been stripped down to the bare frame, so everything can be checked – the bearings and bearing races, the integrity of the frame, function of all parts and if the frame is tatty, it is prepped and repainted. All parts are checked for usability and replaced if they are beyond help (chain, cables, tyres, bearings, brakes, grips, gear shifters, etc. ), then the wheels are checked for true alignment and adjusted where necessary, with spokes replaced if needed and hubs stripped out to check bearings and axles. After everything is given a good clean the bike is reassembled with new grease in all of the bearings, then everything is adjusted to perform as it should. Once that is done the bike is test ridden and advertised for sale. Electric Bike sales and service in Wales – all makes and models catered for. 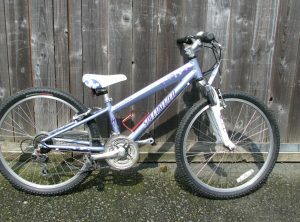 Giant Twist Freedom CS Lite Electric Bike – this second hand BIKE IS COLLECTION ONLY FROM OUR PREMISES IN EVENJOBB LD8 2SA (on the Mid-Wales/England border). Condition: Excellent condition. Large carrying basket on the rear for convenience. Has locking brake function on both wheels. Condition: Very Good condition, fully serviced with new cables.